We at Inner Health Blog we are committed to bringing you the most up-to-date breakthrough information in regards to inner health… both within the body and within the mind. We are especially aware of the need for constant up-to-date information in the areas of brain and gut health as these are evolving topics and have a dramatic effect on the rest of the body. We firmly believe what we eat and how we mentally and emotionally respond to different triggers in our environment has a profound effect on our overall mental and physical health and well-being and, can have a dramatic effect on stress and anxiety levels, self-esteem, confidence, weight loss, obesity, Alzheimer’s disease, dementia, and degenerative diseases like cancer. Hypnotherapy is one area of study that is constantly evolving with powerful new techniques quickly superseding old school methods. An example is in the treatment of Post Traumatic Stress Disorder (PTSD), it has recently been discovered that talking therapies like psychology and counselling may not be as effective as first thought, and may even push the trauma deeper. This is because when you ask someone with PTSD to recall the event, they do not remember it… they relive it. New methods like “The Rewind Technique” use double disassociation are able to release the trauma from the Amygdala, the flight or fight centre of the brain, and allow it to be processed into normal long term memory. Whether it be wealth, a loving relationship, vibrant health or spiritual enlightenment, we firmly believe that the first and possibly the most important step to creating abundance in all areas of your life starts with confidence… your own self confidence could well be the number one stumbling block to you attain all that you desire in your life. Do you secretly fear in the event you request what you long for you’re going to be rejected? Do you set other people’s opinions over your own? Do you have difficulty trusting in yourself? Cause 1: You are subconsciously sabotaging yourself with all the behaviours, thought patterns and strategies associated with unsuccessful, unhappy people. Cause 2: Your current “Emotional Set Point” is actually jammed on minimal. You’re hard-wired with repetitive, subconscious, directives to Compromise and settle for mediocrity as being the ‘best you are able to achieve in life. Self-Confidence – and the lack of it, is such a potent component and holds such a lot of people’s hopes and dreams hostage, it led Dr Robert Anthony to dedicating a lifelong study of self-confidence, and actually published the very first book on the subject, called “The Ultimate Secrets of Total Self-Confidence”. During the previous twenty five years, he has had the chance to work closely with men and women from many parts of society. These people include CEO’s of huge organizations, professional golf players, tennis players as well as Hollywood celebrities. And here’s the astounding factor – irrespective of their particular status, what quantity of money these people acquired, or even how successful these people were, more than 95% of these men and women struggled with a lack of Self-Confidence within certain aspects of their life and, recognized it had been holding them back from attaining their true greatness. The Single, Most Critical, Component which Differentiates those People Who are Successful from Those Who Are Not is… Self-Confidence. Which is why we want you to watch this revealing free presentation… and Discover How to Create Unstoppable Self-Confidence in JUST 7 Days…? 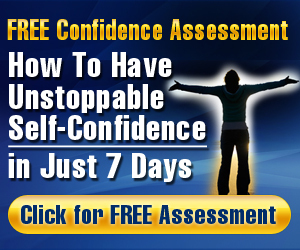 Click Here for Unstoppable Self-Confidence.